When he’s not training with the football team, the freshman business major works on his business startup, practices his golf swing and is always ready to pull a practical joke. 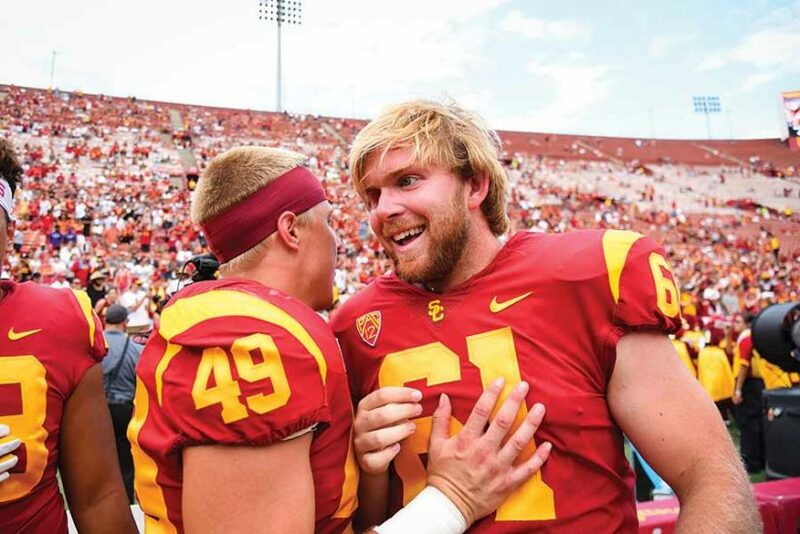 Despite losing his sight at age 12 due to a rare form of retinal cancer, Jake Olson followed through on his childhood dream of attending USC and joining the Trojan football team this year. The long snapper made headlines around the world after taking the field to snap an extra point in the first game of the 2017 season. But football isn’t his only passion. 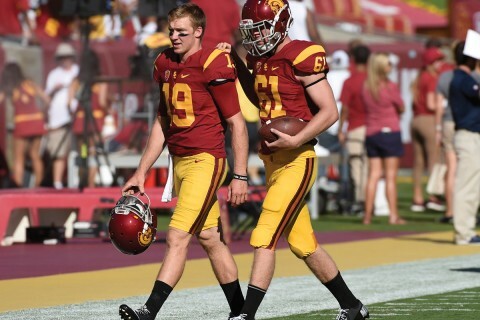 USC writer Eric Lindberg caught up with the business major about his interests on and off the gridiron. 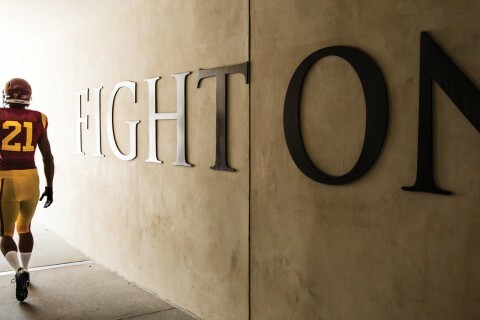 What has been your favorite class at USC? Finance has been my favorite subject so far. Every class is entertaining, plus we are learning a ton about how to calculate the value of stocks and bonds, which is valuable long-term. I find the material naturally interesting, and I have a great professor, Nimfa Bemis [a USC Marshall School of Business assistant professor]. What object in your apartment makes it most clear you are a Trojan? Anyone who walks into my apartment would see that we have a ton of USC gear, whether it’s blankets, posters and signs, or clothes. The quantity of USC objects is probably what would make it most clear that I am a Trojan. Where’s the best place to eat at USC? Little Galen [near Heritage Hall] is my favorite place to eat. The whole staff is incredibly welcoming, and I love their chicken tenders. I love playing jokes on people. What I enjoy the most is doing things that people don’t think I can do because I’m blind. What are some sounds or smells at the Los Angeles Memorial Coliseum that stand out? It’s great hearing all the fans in Section 11 cheer for me when I come out onto the field. I can always hear them yelling my name, and hearing their support means a lot to me. In terms of smells, it is definitely the food. I can always smell the food from the concession stands down on the sideline, and it is incredibly tantalizing. Who is your favorite teammate and why? I would say all of the specialists [kickers, snappers and holders] and I are really close. We spend a lot of time together both in and out of practice, and I know they always have my back. We have a lot of fun together. Do you ever play practical jokes on your teammates or classmates? Of course. I love playing jokes on people. What I enjoy the most is doing things that people don’t think I can do because I’m blind. I love arguing with people about what I see, throwing a ball at someone, or calling out their name when they don’t think I know they are in the room. 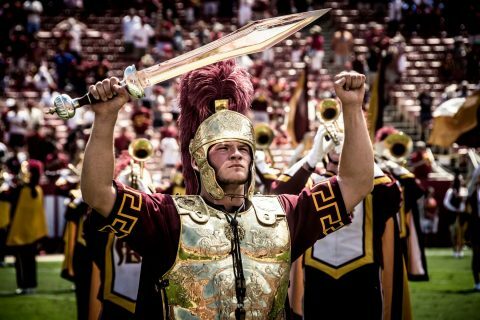 What was it like to lead the Trojan Marching Band after the game against Western Michigan? That was an incredibly special experience. The first time I did it was when I was going blind at age 12, and it was really emotional for me to be back on top of that ladder again. It really felt like my life had come full circle. I definitely did not ever think as a 12-year-old going blind that I would one day be leading the band as a player. Chicken parmesan with a Caesar salad is my go-to. We have it before pretty much all the games, and it gets me ready to play. In addition to your guide dog, Quebec, does your family have other pets? Yes, we are big pet people. We have always had multiple dogs, and we recently got two cats as well. What is it like to have your twin sister here at USC? It is fantastic having Emma here. She is always there for me, and I know I can count on her to help me when I need it. We definitely hang out together but also do our own thing. It is a good balance. Who is your favorite sports announcer? Pat Hughes. I am a huge Chicago Cubs fan, and I love listening to him call games on the radio. We hear you play golf. Where do you play? My home course is Sea Cliff down in Huntington Beach, California. My dream course would be Augusta National, where they play the Masters. What are some of your passions outside of USC and sports? Definitely investing and business. One of my roommates and I are involved with a tech startup called Engage. It’s a platform that helps athletes organize speaking engagements and other events. We are currently in the process of building out the platform, and we have a solid group of athletes signed and ready when we do launch. What are three of the top tracks on your playlist? “Do Not Disturb” by Drake, “In a Sentimental Mood” by Duke Ellington and “Feeling Alright” by Rebelution. I love motivational speaking, and I definitely want to continue to do that. I’d also like to golf more and see how far I can go with golf. A couple dream jobs for me would be general manager of an NFL team or host of my own sports talk show. I really want to stay involved with sports in some way.